By Community Chickens on October 3, 2010 Visit Community's Website. Sure enough, when you look out the window, he’s right there on the railing of your deck, robustly welcoming the day. That rooster on my deck was there for a reason, because we chose to have free-range poultry on our farm. While I’m no crazy bird lady, I do love to watch the chickens pecking around the farmstead and listen to the rooster as he “talks” to them and herds his favorite hens over to the best peckin’ available.It’s almost better than watching the hop toads catch June bugs on a warm summer night under the yard light – but that’s another story. Just sitting and watching the chickens is a relaxing way to unwind after a crazy day teaching and coaching high schoolers. If you don’t have your own flock to enjoy, maybe it’s time you got started. It’s actually a fairly inexpensive and easy thing to do. We began our flock as a 4-H project for our youngest son. Although we live on a farm, our farmstead did not come complete with a chicken house, and we decided to build our own. Knowing that we were a little short on free time, we chose to modify a wooden garden shed that we purchased at an area lumberyard. The first thing we added was a roof vent to ensure proper ventilation for the birds. Next, we chose to cut a hole in the south wall and install a sliding glass window complete with a screen. During the summer the window is open for ventilation, and in the winter it’s closed to keep in the heat. 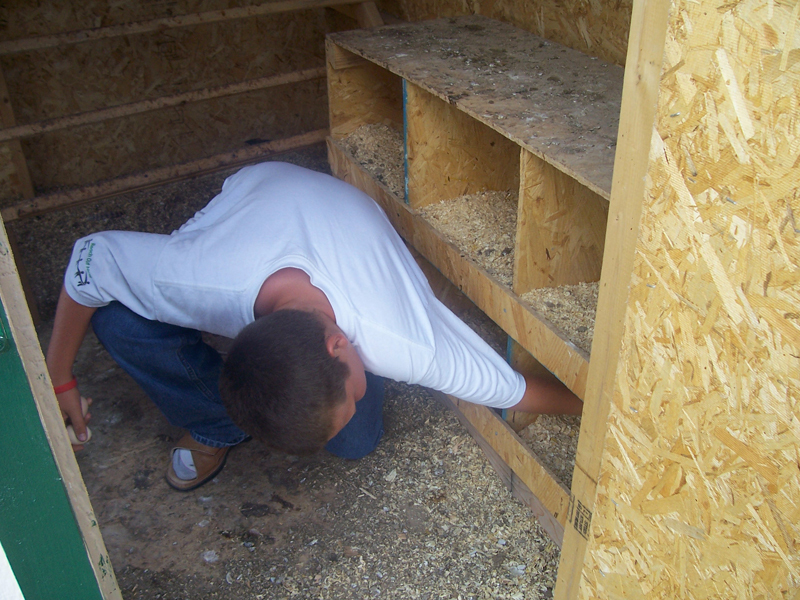 Once we completed the outside of the shed, we built the nests where the hens can lay eggs. The nests are made from plywood, and, once completed, we filled them with wood shavings (the same kind as you would use for bedding lambs). This helps keep the eggs cleaner when the hens are laying. We also installed a roost for the birds to use at night. Underneath this, we bedded the floor with more wood shavings to absorb the bird waste. We built a pen around the chicken house for safety from predators at night. During the day the chickens are free to roam; at night, once they go into their house, we close them inside their house. (We must remember to close the little trap door.) This has helped us to avoid feeding the local coyotes. 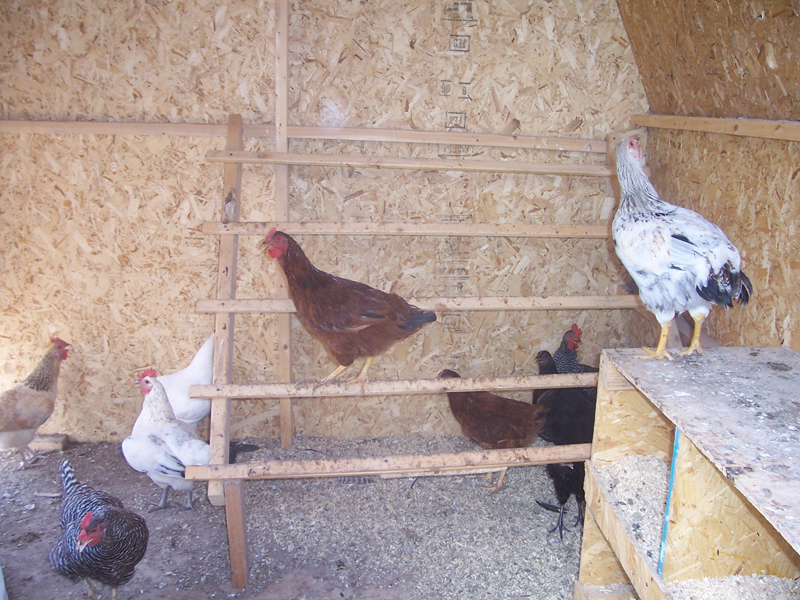 Truly, having chickens has been a great deal of fun for our family, and creating the chicken house was a great way for our family to work on something together. 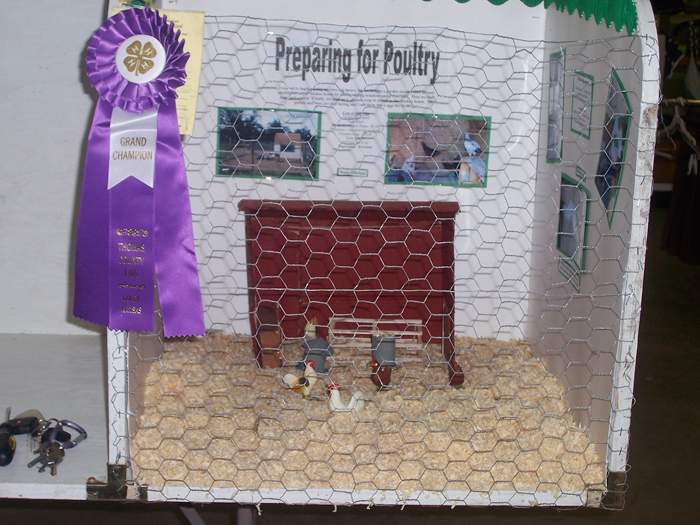 Our son even won an award at the county fair for his project display documenting our process. The next time you’re having a stressful day, skip the chocolate and decide that it’s a day “for the birds” and go home and watch your chickens peck around your yard. 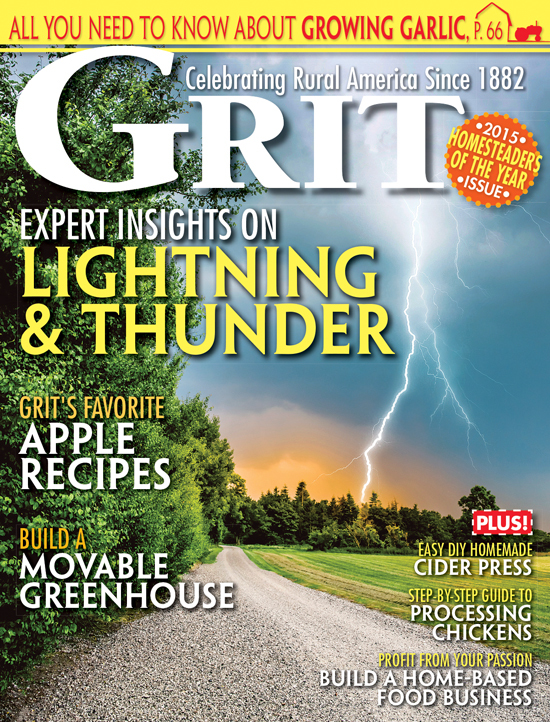 Do you live where it is warm, or did you insulate the hen house? If you insulated it, what did you use? Very nice post! I believe that I would have reacted in both ways to the sight of a rooster on my deck. I certainly love looking at my chickens pecking, scratching, and living their happy chicken lives. It’s better then TV! I remember one time there was a groundhog within a foot of the chickens. They made each other jump a few times until one of the hens decided that was enough and she chased him off. : ) It was so funny to watch!